For the horn construction, we used 7- 5” wide x 12” long (.5” thick) construction foam that we had in the house from a previous project. In retrospect, I would absolutely recommend a thicker foam, as the more parts you have to glue together, the more that might come apart when pulling and prying pieces off. For the adhesive, we tried four types of house adhesive (because we had a lot around and it wouldn’t cost us more money) to see what held the best, which included Hot Glue, Tack Glue, Elmer’s Glue, and Rubber cements. During our initial glue tests, we were looking for good strength in the bonding, the ease in which our tools cut through the glue, and the rate at which glue dried (the sooner the better for us). 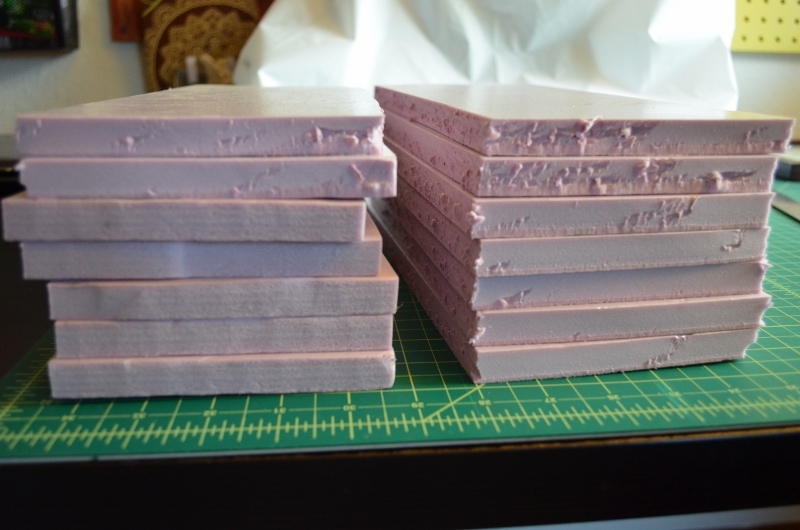 For our initial tests, we glued together 4 small planks of construction foam, and actually found hot glue held surprisingly well, was capable of being cut through relatively easily, and was ready to be cut within minutes. We were initially concerned with the hot glue melting the foam, yet the layer of glue was thin enough that it left little if no indentation in the foam. The issue I found out later however, was that hot glue does not spread quickly nor consistently enough to be an effective adhesive for the scale of planks I was gluing; and although it held firm in small tests, in the larger blocks it pulled apart easily between layers and needed constant touch ups. The fact of the matter is, use a different adhesive and wait for it to dry, it will be less frustrating. Elmers glue worked surprisingly well, and was used for some touch ups, it did take quite a bit of time to dry. Taking one of the test planks we used for our glue tests, Stefan created a prototype horn inspired by the new Disney movie Maleficent. The most glaring difference between the horns portrayed in Maleficent, and those drawn in Sleeping Beauty, is that the tip of the horns point inwards, towards each other, instead of away from each other. I greatly preferred the general aesthetics of the inward pointing horns as a personal preference, but they also had practical application as well, specifically, I don’t have to worry as much about poking anyone’s eye when I move my head around. I also did not want to replicate Maleficent’s horns exactly, as I also wanted the horns to lay closer to my head rather than shoot upwards. This decision had neither rhyme nor reason. Although I would be able to enter doors and entry ways easier, I now had to be more concerned about hitting others around me. Additionally, a lot of concept art for dragons tend to have the horns projecting from the head straight out, whereas the arch to the back of the head is more what we see of rams. But it seemed more aesthetically pleasing to me. What was really surprising about designing the horns was how difficult it was to actually design them, as drawing a twisting and narrowing cone seemed more difficult to depict in a 2-d space, or at least enough so that the designs would not be transferable to a larger surface. Stefan, more capable of translating the 2-d to a 3-d space than I, drew on the top view and side-profile of the horn, and gave me the single instruction to cut to the designs, but don’t remove the designs outright, as I would not know where to cut. 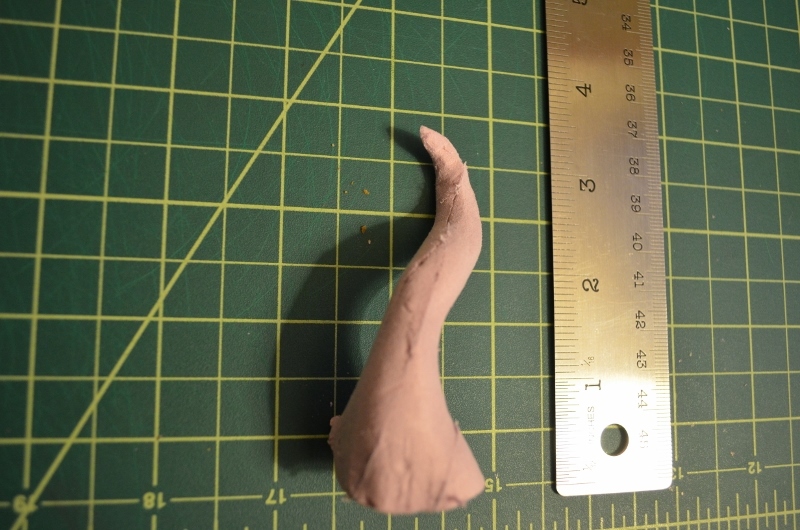 As someone who is use to adding substance to create something (clay, drawing, etc), removing substance to create something was at first surprisingly complicated to comprehend, and it took a while for me to really grasp what I was trying to do. To cut out the pattern, I initially used three primary tools: a hand saw (for large removal), a box cutter (for removing large chunks in smaller areas), and an Exacto Knife (for the details). Later, I added a small blade that Stefan had picked up for his previous project for the specific purpose of cutting and shaping foam. In addition, since I was cutting home insulation, which is fiberglass, I wore a mouth mask to make sure that I did not inhale any particles, even if the particles I was cutting were a bit larger, better safe. I wear glasses for reading and fine detailed work, so my eyes were also fairly protected. For easier clean up, I put down a piece of newspaper print paper, which is actually a specific type of paper, but this is optional and any type of paper would do. At the end or start of my next session I would clean up my work station, as it made it easier to find my tools and work in general. OH NO! Cut to much off the other side! At first I approached this project with trepidation and little bouts of 3-d confusion. Slowly but surely however, the horns started to take shape, and soon I started to feel more confident and bold, bold enough to actually use the hack saw. This, sadly, quickly went awry, as I accidentally sawed off more of one side than I should have [image]. Part of the problem is that I never transferred the side-profile to the opposite side and I did not keep the handsaw level while cutting, leading to a nearly irreversible error. To relieve the anxiety and frustration of my accident, I decided to take a break from the first horn, and actually start the second horn. 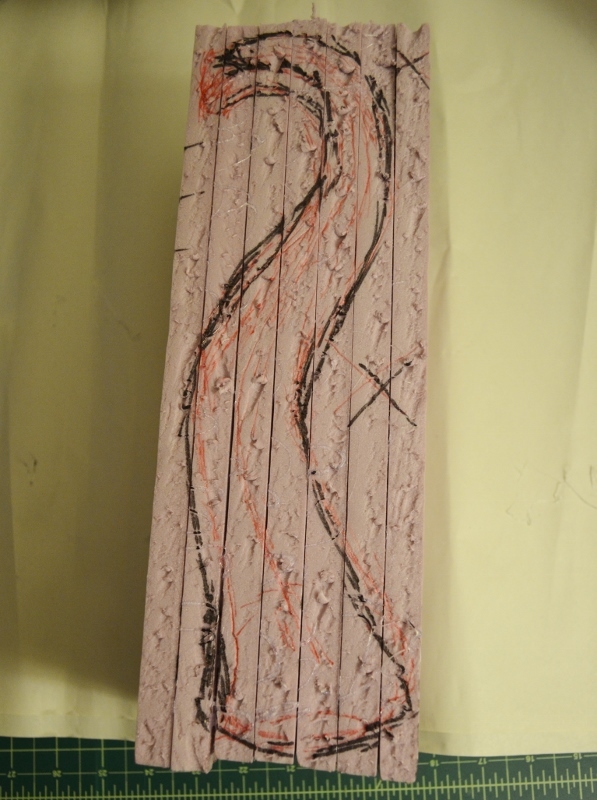 To do this, I transferred the design to tracing paper, which I should have done right away, and then traced along the design with a boning tool onto the second block, which easily indented the foam. In addition, I put the side profile on both sides of the block to prevent the error of the first horn. To make sure that the sides matched up, I marked two notches where the horns would meet the top of the block on the tracing paper and block, and used a 90 degree triangle to make sure that they matched on both sides. To start, I ended up cutting out sections by layers (seen in the top view), and would start by finding the point in which a layer intersected the horn design, and cut out the chunk of layer that was negative space. This was a very tedious process, but through it I slowly regained confidence in cutting, even to the point I could use the hand saw again. Eventually I was left with a modular horn, but a horn none the less. With renewed confidence, I was able to attack the first horn again, and get it to a point where it looked similar to the first horn. Overall, this whole process, of gluing, designing, and carving took about 2-3 hours a day for 3 days, with the gluing, designing, and some carving occurring on the first day. Of course, it went quicker once I gained control of the situation and overall if I had to do it again it would go even faster. 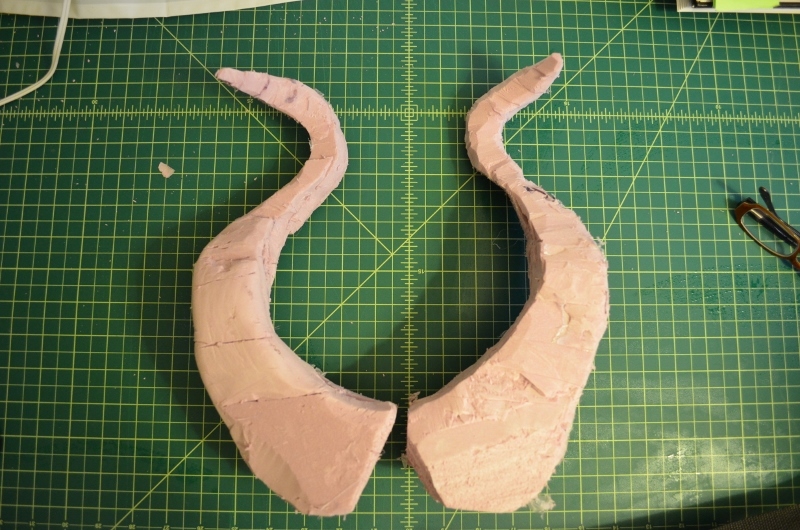 Once the horns were roughly finished, I used the Exacto Knife and foam blade to start refining the edges more. 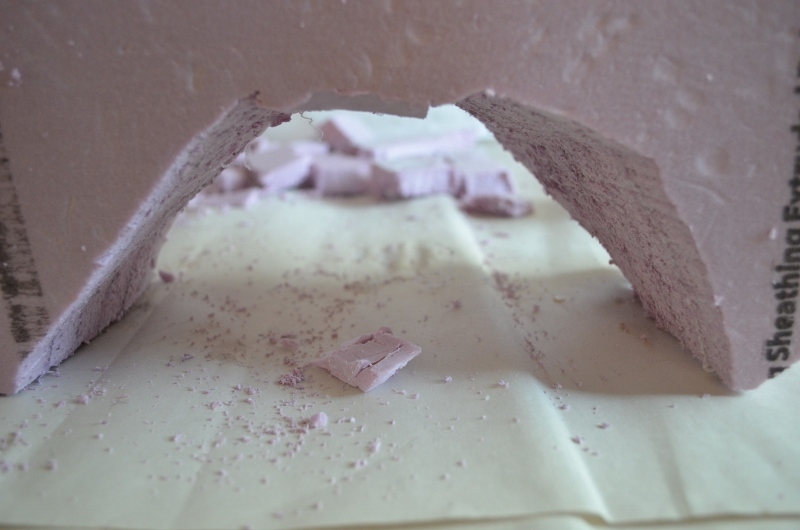 In addition, I used a very coarse sand paper, and began to smooth and round the edges. Nervous about rounding the edges with a blade, I actually started with sanding the horn, and worked between sanding and then cutting to help me get to a recognizable horn. After days of working so intimately with the horns, I began a small break to help design the outfit of the slayer. So a brief intermission will be noted soon. At this point we are uncertain of how the horns will be finished. In my mind, I had just seen myself painting or wrapping the horns in a cloth after they had been sealed somehow. 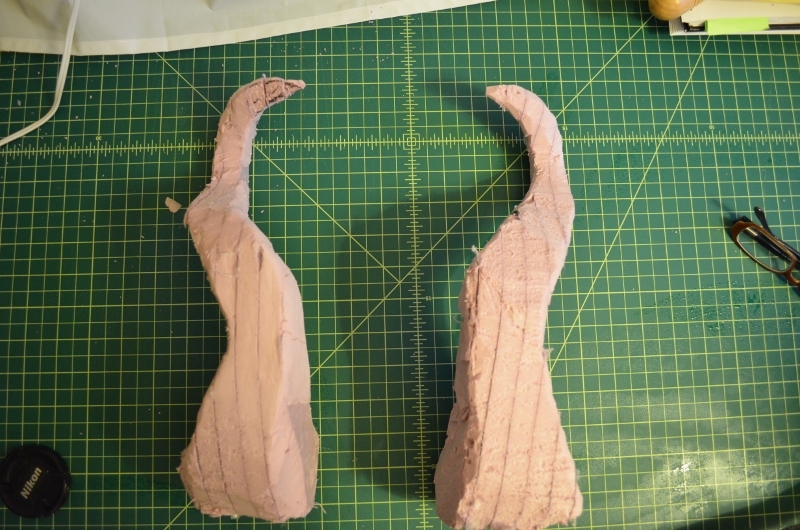 However, this would mean that any mistakes I made, or any areas I had to fill with putty would make the horns heavier, possibly variant in weight, and need to be sealed in some way or another. Stefan wants to make a mold of the horns, so that we could easily correct any mistakes, and we would be able to make as many horns as we want. I am hesitant because of cost, but it is a process that he has been dying to investigate since it will undoubtedly be a method used in later costume designs. It has been put on the back burner until I actually finish the horns themselves.